I(Mary) played a very small part in a seminar for pastor’s wives on shame and honor a few weeks ago. A dear believer, L. from north Togo, shared a very powerful testimony of how God shined His light in her darkness. She was saved while in prison, but did not live for Christ till several years later. Her repeated encouragement to the pastor’s wives was that they wouldn’t give up on their own prodigal daughters- no matter how hopeless their lifestyle becomes. We counted many pastor’s wives who had errant children and I saw tears in several eyes as L. spoke. 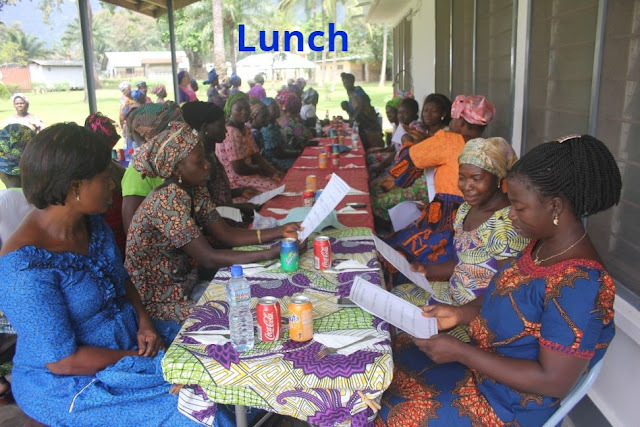 Please pray for wisdom for Beky Poteat (fellow missionary) as she mentors these ladies. Last month, Andrew participated in the examination and ordination of a village pastor. Often, in Togo, village pastors do not have much theological training, but this pastor graduated from our Bible Institute program in 2017. We’re praying that he’ll continue to study the Word as he leads his church. 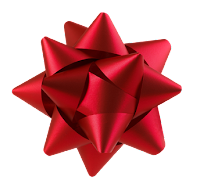 Give a gift! We celebrate Christmas in Togo, too! Here's our Christmas wish list for the Christian schools! You can participate by making a donation at ABWE.org/give. Since our return to Togo in August, we've settled back into work and life here. We've been able to get together a few times with our partners in the Christian school ministry. While in the States we raised funds to provide them with new vehicles since their old motorcycles were at the point of dying. 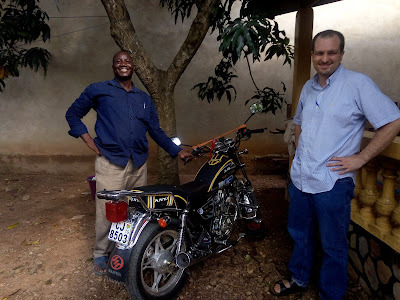 Ewtonville Baptist Church, in Dunlap, TN graciously provided this funding, so that Roger was able to purchase a new motorcycle and Koudjodi put the money towards purchasing a car. Since this week marks 4 years since we received our truck, I thought it appropriate to add it to this post as a praise to God for his faithful provision. "Four months of waiting have finally paid off! We're so thankful to finally have a reliable vehicle that we hope will serve us many years here in Togo." "Trying it out. Never had a vehicle that came with the plastic still on! NEW! Sooooo thankful!!!" "Andrew's first drive through Lomé was a success!" Another month gone by, another 1,700 miles traveled. This time we headed north to PA for a week long conference with other missionaries who are involved in pastoral training around the world. Andrew enjoyed collaborating with others who have a heart for pastoral training and was glad to have Germain Fayosseh join us from Togo for the meetings. Germain is a graduate of Liberty University and teaches courses at the Bible Institute in Togo. God gives such good gifts. Despite the long hours in the van, we are so glad we got to see such wonderful friends along the way. One from Mary's childhood, some from our days at BJU and many whom we met on our journey to Togo. These old and new friends loved on us and encouraged us so well as we prepare to return to Togo. Last summer we asked for donations for Bible curriculum for the Christian schools. We received several boxes of new Bible flashcards for the teachers to use as visuals. We laminated them all so they will last as long as possible in the heat, humidity, and harmattan dust winds of our West African home of Togo. When the schools were started, Bea Ward and her team of teacher-trainers worked grade by grade, starting with 1st grade. And because 1st grade was the first to receive the Bible curriculum, theirs is the most used and in need of replacement. With the opening of new schools and the constant use of old curriculum we're seeing the need to ship more out on a container to Togo this Summer. Are you interested in helping us purchase more Bible Curriculum for the Christian schools? Please email us at andrewandmary@abwe.cc for the list of curriculum we need purchased or CLICK HERE to give to this project (please mark your gift for "Bible curriculum"). Since we've been back in Chattanooga our time has been consumed by packing tubs to ship to Togo. We're sending supplies for the Christian schools, laptops for local pastors, homeschool materials, and other various vital life sustaining items, like battery operated fans and contact lens solution.